Your bible says plainly that if you don’t practice Yahweh’s Laws, you do not love your neighbor. So the next question is: What is Righteousness? The answer is found in your bible also. But let’s first look at what sin is. Sin is the breaking of Yahweh’s Laws. That’s a Scriptural fact. Sin is the opposite of Righteousness. Now notice what Righteousness is. So he who practices Yahweh’s Laws practices Righteousness and is Right-eous. But he who practices sin, breaking Yahweh’s Laws, is not Righteous, does not love his neighbor, and belongs to Satan the devil. The Name Yahweh was replaced in both Part 1 and 2 of The Book of Yahweh, and they readily admit this. The True Name of the Savior, Yahshua, was replaced with the names of two pagan Gods. The world was deceived with this change after the followers of Yahshua were killed off with crusades. The younger generations were brought up with the titles of Lord, God, Jesus and Christ and never knew the difference in what the Inspired Books of The Book of Yahweh really said. So, they don’t even know who they worship when they attend a religious meeting today. Think about this, none of the religions today practice Yahweh’s Laws except those who come to the Established House of Yahweh. The House of Yahweh is what Yahweh has always called His Work. That name belongs to the group in Texas that was started and established by two brothers who fulfill the Prophecies concerning the Two Witnesses. Both The House of Yahweh and the Two Witnesses were prophesied to be established and working in the Last Generation, taking the Message of the Kingdom of Yahweh to all nations, in the Last Days. The Message is a warning to all nations that True Love is practicing Yahweh’s Laws. If you don’t practice Yahweh’s Laws, you don’t love the Heavenly Father, Yahweh, neither do you love your neighbor. In fact, the religions and their followers do not know what True Love is. “When you see all these things,” means you can or will be able to see the things prophesied. The Savior is speaking of the religions that lead the world in this generation, being as evil and violent as in the days of Noah when Yahweh allowed all but one family of eight to be destroyed by the flood. What was mankind like in that generation? The only family on earth, in that generation, practicing Righteousness was Noah’s family. All of the religions and their preachers practiced “religion” but they weren’t practicing Righteous-ness. They were not keeping Yahweh’s Laws of Righteousness. They all belonged to Satan the devil, as they do in this present generation. You can see this and it’s clearly written in I Yahchanan 3:4, 7-8. The Savior, Yahshua, was totally different from all of the religious leaders in His Generation. He came preaching and practicing Yahweh’s Laws of Righteousness. Notice His Teaching. The Savior was taken up into heaven around 29 A.D. (C.E.) Forty years later, the Apostles were still teaching the same thing the Savior taught when He was on earth. The religions teach love in word only. However, there is no guidance to Lawful acts of love. Their gestures of love are: give money to the Salvation Army for a turkey dinner once a year, or take used, unwanted clothing there so they can be sold to the poor. True love is much greater and everlasting. True love comes when one or more people agree to keep the Laws of Yahweh, which are Laws of Love (II Yahchanan 1:6), that guide one against doing anything that brings harm to others or oneself. Do You Dare Consider These Laws That The Religions Hate So Much? The Savior came preaching the Laws of True Love. He never mentioned anything about giving a turkey meal on a pagan holiday. That tradition was created to sell turkeys. It’s nothing more than a marketing campaign instituted by merchants to sell their products. The holidays pull in the largest sales. Yes! Did you fall for the religious lie that the Pilgrims had turkey and that’s the reason turkey is served on the holiday called Thanksgiving? Call or write for the facts. Request the booklet, The World’s Thanksgiving Day—A Part Of The Ancient Pagan Harvest Festivals. Also ask for the booklets that uncover the lies about Christmas, Easter and, of course, Halloween, the worship of dead rabbis. The practice of these holidays makes turkeys out of the whole world today. You really need the information found in the previously mentioned booklets. When the Savior taught Yahweh’s Laws of True Love, that are hated so much by the religions, He exposed the sins of all the religious leaders and the people. That’s why you were created and given life, to train for the Great Yahweh Family. You have no other reason to live, other than to try out for an eternal job in Yahweh’s Kingdom. Notice what is first stated in Genesis 1:26, “I will make man inMy Image and Likeness“. Then Yahweh says, I will give him Authority. Your training starts with you choosing to practice Yahweh’s Laws of Righteousness. Notice that breaking Yahweh’s Laws brings death and destruction. In these Last Days the world is facing defilement of our water, soil, and air; as well as, the preparation for war, including nuclear war. At the same time, they are dealing with defiled minds and bodies, making problem solving impossible. In fact, we see more problems being created than being solved. Frustration is now so deeply imbedded in nearly every person on earth that their thoughts are filled with bitterness, hatred, fighting, and war. Of course, all of this is a result of the extreme confusion of the mind. This extreme confusion did not come overnight, but over the 6,000 year history of mankind. It came from breaking Yahweh’s Health Laws. When they are broken, certain parasites are allowed to enter the bloodstream and build homes in the organs, including the brain, and disable the brain to a certain extent. That’s only the start. What the mother and father do or what is done to them is passed on to the children. The children are then born with defects. Then their own Lawbreaking adds to more weakening of the body and brain. Thus, each new generation is weaker than the one before. Some family members in previous generations found the knowledge in the Holy Scriptures and started changing their eating and living habits. As a result, some correction has been done and they are now living longer. On the other hand, those who have made no change in their lifestyle are dying sooner and suffering more during their lifetime. What is really sad to see are the children born with the curses from the sins of their parents, grandparents, great grandparents, and great, great grandparents. All children are now born with defects. The doctors are telling many women today that a C-section is best for them because their reproductive organs are so infected that if the baby came through them, the baby would get the diseases the mother has hidden there. Many other women, due to the sins of their ancestors, are unable to have a natural birth, even if they wanted to. This means the bodies of mankind are getting weaker with each generation of sin and sickness because they are taught to sin by the religions of Satan that claim they are teaching you the bible. But they lie as they continue to teach that Yahweh’s Laws were done away with. So all the world is being led into deception now, as they were in the days of Noah, when only eight people were allowed to live through the flood. The vast majority of the population today are caught up in entertainment, which does nothing but destroy the body and mind. Yet, they have geared themselves to it for so long that it has taken over their sick minds to the point that even when they are in the hospital dying, they want the television playing in front of them until their eyes can no longer stay open. Entertainment takes control of the mind and emotions. No thinking is involved, so your mind deteriorates and dies, as any unused organ of your body does. When I was in college, I often visited and taught in the nursing homes. I was surprised at how quickly memories of education vanished from the mind, when the mind stopped being exercised. Patients, who were once school teachers, after only a few months of inactivity and hours of entertainment had difficulty reading. I tried to persuade them to turn the television off and start reading the Holy Scriptures to keep their mind alert and growing. They always agreed, but with minds weakened by parasites from STDs and unclean food it was much easier for them to let the brain finish dying from the education of the uncontrolled illegal lust of the Gods of Hollywood. From these same Gods came the teaching of sin and the breeding of STDs, which further sickens the mind and body. Television came into homes in the 1940s. By the `50s and 60s, the world was “swinging” in more ways than one. They swung away from reading the Holy Scriptures, the only source of health education for the mind and body, to the entertainment of sin—the breaking of Yahweh’s Laws. They swung away from Yahweh’s Laws, the guide to healthy living and an eternal future in the Kingdom of Yahweh. Since that time period, health has deteriorated, and STDs and all other sicknesses and diseases have increased. The minds of nearly all the world are to the point where they are collapsing, seemingly, without warning. Scientists have a lot of names for this condition, but the fact is, the cause is the Health Laws being broken by all religions, which is bringing an alarming increase in sickness and disease of all kinds, as well as unlimited confusion. The religions, as I remember in the 1940s, fought Hollywood and television in the homes for a while, but they finally gave in and actually joined them in bringing forth sin. 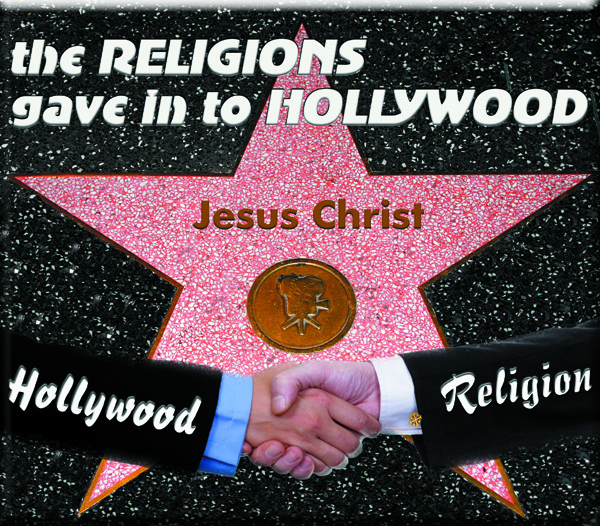 Now, in trying to get people into the churches, the churches invite the Hollywood stars and pay them to entertain their congregations and to sign autographs. In these same churches are recreation rooms where video games are used to coax the young people. Of course, they have games for the older people as well. All the while, they tell their “victims” that all is well, when they die they will go to heaven to float on a cloud and play a harp day after day. 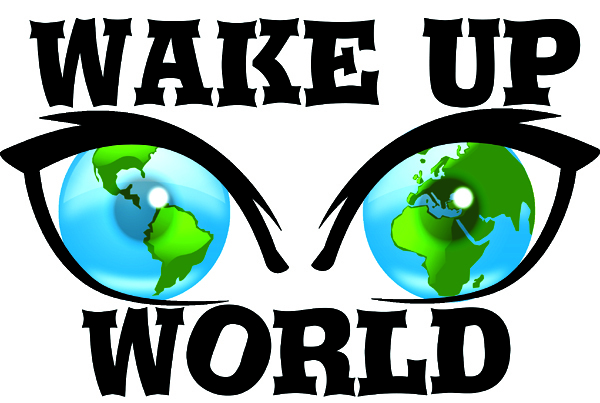 10 Your watchmen are blind, they are all ignorant; they are all dumb dogs, which cannot bark any warning;sleeping, lying down, loving to slumber. 11 Yes, they are greedy dogs; insatiable of appetite, which never have enough. They are also shepherds whocannot understand ; they all look to their own way, each one for his own gain, from every quarter. That’s why they killed the Savior, destroyed the temple and moved everything to Rome. See Titus or call or write for the information. From Rome they organized their crusades against Yahshua’s Disciples and all of His followers in Galilee and throughout the known world until they thought they were all dead. They didn’t know that many Galileans had fled by boat and across the North Pole to a land that later became the chief of the ntions. That prophesied land was shown by the Prophets as the place where Yahweh would re-establish His House—a House that would teach the Laws of Yahweh and bring True Peace to the earth. 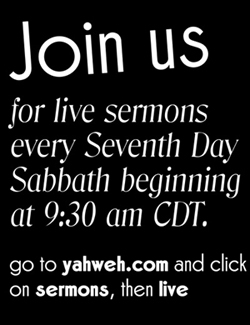 Call or write for information about the Last Days’ Work of Yahweh. Notice this Prophecy is to show what comes to us in the Last Days, the Last Generation, from the sins of our forefathers around 1600 B.C.E. Carefully notice the words of this Prophecy. One of the sexual acts that has developed confused characters in billions of people today is shown in the evil act of Reuben. The population of the earth, bred mostly from the twelve tribes, is defiled because of this sin that started the defilement, which has spread for almost four thousand years, and has grown worse in these Last Days. Illegal lust has increased to uncontrollable magnitudes in these Last Days and has brought defilement to all nations—the earth, air, and water. From the time that Genesis 49 was written, around 1689 B.C.E. to 2011 C.E. is 3700 years. Now compare the Prophecy of the Great Prophet Isayah for 2011. 5 The earth also is defiled under the inhabitants of it, because they have transgressed the Laws,changed the Ordinance, and broken the Everlasting Covenant. This is speaking of the defiled minds and confused judgments that have built nuclear bombs that can destroy huge cities, and the nuclear wars that are soon to come in this time period. The Savior spoke of this same time period saying that love would grow cold and He shows why. Read this for yourself and know that it’s one hundred percent accurate for this time period. 9 Then they will hand you over to be afflicted, and will kill you; and you will be hated above all peoplesfor My Name’s sake. This religion was joined by the Roman army that was built and governed by the violent priests who took the temple and Yerusalem by force. Notice, Daniyl said the armies would stand with them. They would destroy the temple. Titus destroyed the temple and moved all the artifacts to Rome. Call or write for information. There in Rome the Pharisees changed their name to Catholic, meaning universal, and became known as the `holy’ Roman empire. From there the crusades became worse. They killed all who disobeyed the popes. In the same way, when you see all these things, know that His coming and the End of the Ages is near, at the very door. Remember that practicing Righteous-ness is practicing keeping Yahweh’s Laws. Whoever does not practice Righteousness, keeping Yahweh’s Laws, does not love his neighbor. They say they love, but your bible calls them liars. Because of the way in which verse 5 was written, many people down through the centuries have erroneously believed that Malakyah was speaking about Yahweh’s Servant and Prophet, whose name was Yliyah (I Kings, Chapters 17-21). The word Yliyah means the Strength of Yahweh. Yahweh’s Laws and the Prophets are the Righteous Strength of Yahweh that can change the heart and mind (Romans 1:16, Proverbs 10:29). Yahweh’s Laws show His Righteousness and Ruling Authority; and all of His Prophets proclaimed His Laws. Yahweh’s Laws show His Righteous Image and Likeness. The only reason for the creation of mankind is for the purpose of making him/her into the Image and Likeness of Yahweh and to give them Authority over the works of His Hands, which is the universe. If you will not choose life by Righteousness, there will be no reason for you to exist and you will perish as Yahshua Messiah says. Sinners? What is a sinner? All of the religions of the world except the Last Days’ Established House of Yahweh teach the people to sin, making them belong to Satan the devil. Look and read what these filthy religions are teaching your children. The only people on earth in this evil and adulterous generation who belong to Yahweh are those who are now learnign and practicing Yahweh’s Ways at the re-established House of Yahweh. 2 And many nations will come, and say: Come, and let us go up to the mountain; uplifting of Yahweh, and to the House of the Father of Yaaqob, and He will teach us of His Ways, and we will walk in His paths. Because the Law will depart from Zion, and the Work of Yahweh from Yerusalem. The Laws did depart from Yerusalem, as prophesied (verse 2). The temple was destroyed by the Pharisees who now call themselves Catholic. Yahweh is not worshipped in Israel. Therefore I say to you: The Kingdom of Yahweh will be taken from you, and given to a people of the same habit, but from a foreign land;and they will bring forth the fruits of it. 21 Yahshua said to her: Woman, believe Me: The hour comes whenyou will worship the Father neither on this mountain, nor in Yerusalem. 2 And many nations will come, and say: Come, and let us go up to the mountain; uplifting of Yahweh, and to the House of the Father of Yaaqob, and He will teach us of His Ways, and we will walk in His paths. Becausethe Laws will depart from Zion, and the Work of Yahweh from Yerusalem. There are many prophecies in your bible showing Yahweh’s Last Days’ Work of The House of Yahweh and the Two Witnesses. Call or write for information. Yes, but don’t be deceived. Only believe all that the Prophets have spoken. You also need to repent, not just `believe’ only. However, you do need to believe all that the Prophets have spoken (Luke 24:25). Read for yourself. Of what do you need to repent? Sin, the breaking of Yahweh’s Laws. Don’t be deceived, only believe all that the Prophets have spoken. You also need to believe all that the Savior, Yahshua Messiah, and His twelve Disciples have written and spoken. Then you need to convert to practicing Yahweh’s Laws. Right now, you belong to Satan. Obey Yahweh and you will become in the Image and Likeness of Yahweh. Obey deceivers and you will become in the image of Satan and her Gods. True Love is practicing Yahweh’s Laws. Blessed will you be if you do so. Call and let us help. The House of Yahweh is the Prophesied Work of the Two Witnesses.